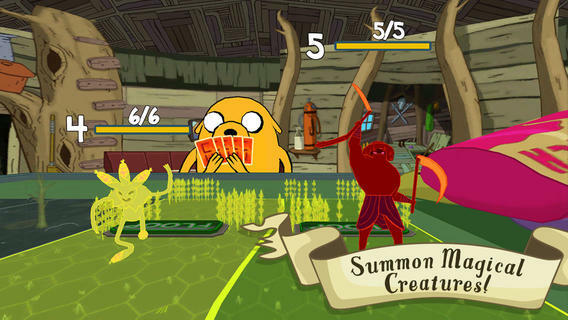 “Card Wars – Adventure Time” is a production of American television animation background card game, the game in the form of checkpoints, using the current popular time to recover for the game, each challenge will need to spend a Heart , Will restore point every five minutes, the game method is similar to Carcassonne, etc. Fresh and beautiful screen is ideal for casual play. different from the “big ski adventure expedition clown” Hearty parkour gameplay, this is exquisite as a strategic board game of cards. Collect new cards to customize your deck for each opponent. Level up your creatures, spells, and towers, or fuse them together to make your cards even more powerful. Think you’ve got what it takes to be crowned a Cool Guy, or will you end up drinking from the Dweeb cup? Play as Finn, Jake, BMO, Princess Bubblegum, Marceline, Flame Princess and more as you wind your way through the Land of Ooo!